Imagine if a daily dose of baking soda was all it took to reduce the pain and inflammation of arthritis? A team from the US recently published positive findings in this area, leading to media coverage and global speculation from people with arthritis. 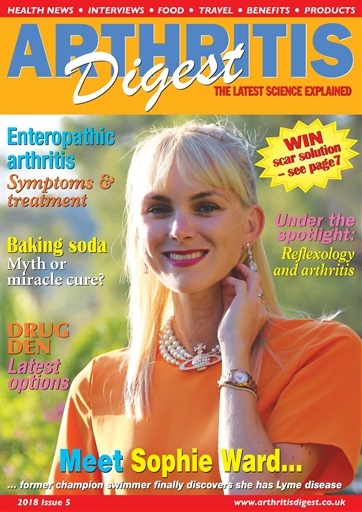 So we spoke to the research team involved who report that while their findings could lead to new approaches to managing arthritis, baking soda is NOT currently something people should use to self manage their arthritis due to potential side effects. Turn to page 17 to find out more. Reflexology, on the other hand, is a therapy suitable for almost everybody and we review its effectiveness and outline what to expect on page 8. 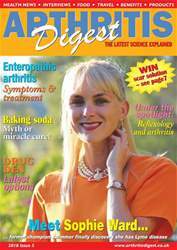 Elsewhere, as well as our round-up of all the latest research, enteropathic arthritis is under the spotlight on page 15. And for those seeking an escape this winter, turn to the back of the issue for Natasha Wills's latest report.